The largest accidental marine oil spill in history occurred between April and July 2010 and resulted from an explosion and the sinking of the BP oil rig Deepwater Horizon, causing the deaths of eleven workers. During the eighty-seven days, 4.9 million barrels (210 million gallons) of oil spilled into the Gulf of Mexico causing grave ecologic and economic damage to the Gulf States of Louisiana, Mississippi, Alabama, and Florida, along with its residents and cleanup workers. As of 2013, the criminal and civil settlement will cost BP over $42 billion. The spilled oil contained 40 percent methane that can potentially suffocate marine life and create “dead zones,” where oxygen is depleted from the water. Oil cleanup approaches included physical methods (skimmers, booms or floating barriers, controlled burning), chemical dispersants, and bioremediation with microbes. Some of these were beneficial, while others made a bad situation much worse. The oil dispersant Corexit contained cancer-causing ingredients and was found itself to be toxic to phytoplankton, coral, oysters, and shrimp. It caused mutations in shrimp, crabs, and fish, and produced respiratory and skin irritation, mental health problems, and liver and kidney damage in cleanup workers and residents. The dispersant also made oil sink faster and deeper into beaches. A 2012 study estimated that Corexit increased the toxicity of oil by 52 times. By contrast, bioremediation with the oil-eating microbe Oceanospirillales was highly effective. This naturally occurring bacterium appears to have evolved in the Gulf over millions of years and consumes oil from natural seepage. The concern that it would create “dead zones,” which would be detrimental to marine plant and animal life, did not occur to the extent feared. In March 1989, the oil tanker Exxon Valdez ran aground in Prince William Sound, Alaska, spilling 260,000–750,000 barrels (10 million gallons) of oil affecting 1,300 miles of coastline. The oiling of animal fur or feathers caused a loss of insulating capacity, leading to death by hypothermia. Among the mortalities were sea otters (1,000–2,800), harbor seals (300), sea birds (100,000–250,000), and bald eagles (247). Some estimates suggest that environmental recovery will take up to thirty years. SEE ALSO: Population Growth and Food Supply (1798), Ecological Interactions (1859), Population Ecology (1925), Can Living Organisms Be Patented? (1980). 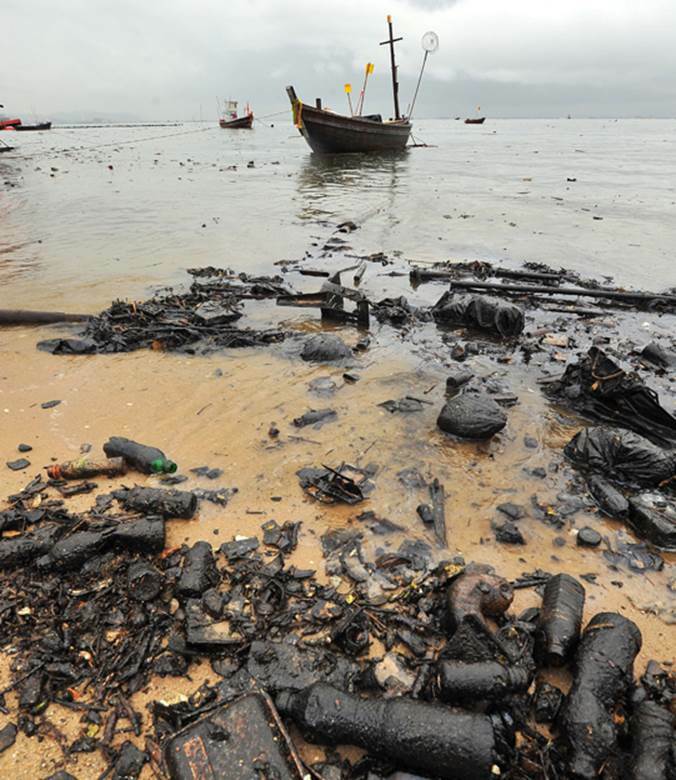 Oil spills can produce “dead zones” in the water, depleting oxygen and causing suffocation of marine life. In addition to the grave ecological damage are the economic consequences resulting from the absence of tourism on once-inviting beaches.